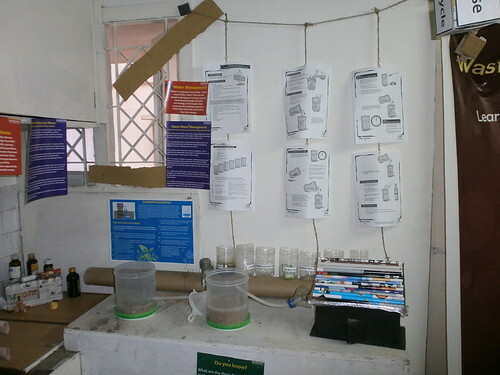 Suseum, an initiative of Energy Alternatives India (EAI), Chennai, is a ‘sustainability museum’ that showcases, and encourages people to adopt sustainability practices and principles in their daily life. “The vision behind Suseum is to enable each and every visitor to start taking practical steps towards sustainability. To this end, we have a mix of things over here – videos, activities, demos of products…”, says its founder, Narsi Santhanam. Intrigued, I went to see for myself what they have created. 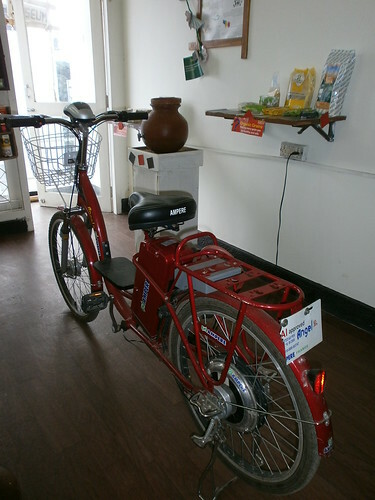 This is an electric cycle that can be used to commute over short distances, and runs on battery that can be charged by the mains or solar panels. It seems their founder sometimes comes to office using this bicycle. Behind it you see some packages – they are organic grains (rice, wheat, pulses, etc.) that have been grown without chemicals/fertilizers, and hence are more healthy. There were many organic products in display – incl. an organic (herbal) mosquito repellent that can be fixed in our All Out/Good Night machines! There was another room where they had many educational posters on clean energy technologies, energy efficiency and green buildings. 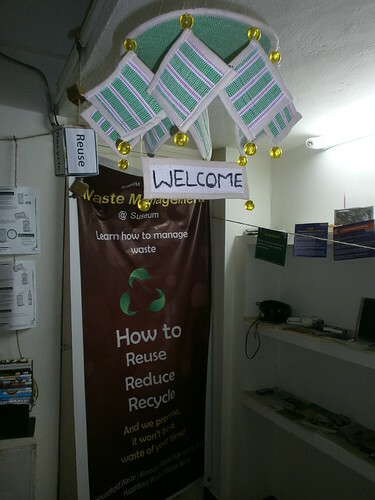 In this room they demonstrate good waste management practices (source segregation, safe disposal, etc.) and technologies like waste water treatment & rain water harvesting – these help save water in overcrowded Indian residences, instead of sending it all to the sea or letting it evaporate. It seems, most of our hazardous waste (medical, electronic) can be recycled (on a centralized basis), but recycling is expensive. At least, it can be done! 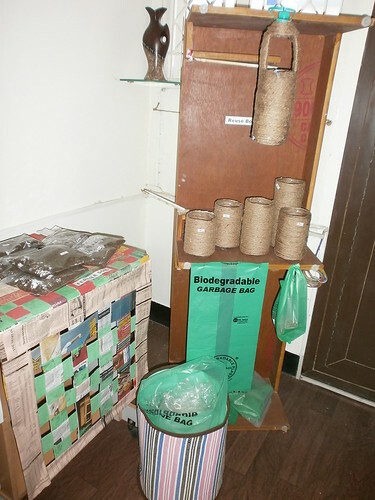 The decorative item you see in the above photo has been made using waste. Cute, isn’t it? Another room showcased renewable energy exhibits. The usual solar, wind, biomass, etc. were there, but two things caught my attention – Solar cooker, that uses the energy of the sun to cook food, and Jatropha oil that is used to make bio-diesel/bio-fuel. In future, it maybe possible to grow our own petrol/diesel! It’s cool, except for pollution and possible diversion of cultivable land (now used to grow food). There was a display of craft items made by kids, using newspaper and other waste materials. 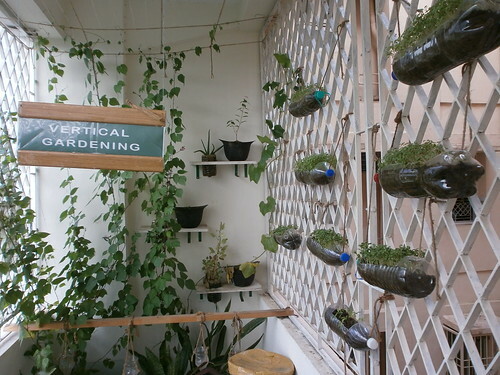 Nearby, there is a balcony that has been converted into a vertical garden! In this 5th floor apartment balcony they are growing many varieties of plants including coriander, beetroot, ladies finger, etc. If you look at the above picture carefully, you’ll notice that the excess water in one container will flow into another, thereby minimizing wasted water. 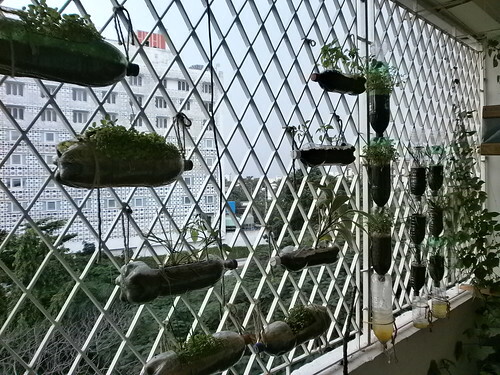 All the plants were grown in discarded materials like cans, plastic bottles, etc. This sustainability museum is open to public from 9 AM – 5 PM on weekdays. For location and further details, refer to their site. They have shared so much information and knowledge. The museum is fantastic. Yes, the concept is very interesting. We need to take sustainability seriously. There is no point in over-consuming resources and wondering why we are still sad! This is interesting. I have noted down the address. I must visit this place once and buy something from here! They have some nice decorative purses and items. Some utility items also. All made from waste. Do buy and let us know how it is. Yes, it is better to use plastics for purposes like these as they are non-biodegradable. In future, we should insist on biodegradable type plastics – they have such plastic covers in their shop. Thanks for the nice intro for sustainability museum in Chennai. And, thanks for sharing these beautiful photos. That’s a great initiative. Thanks for the information. The information has been given in order to inspire others to follow some sustainable practices. ?.